FireKeepers Casino is owned by the Nottawaseppi Huron Band of Potawatomi. The casino is located just off Interstate 94 at Exit 104, a few minutes east of Battle Creek, MI. 2,000 seats for concerts, meetings, weddings, and conventions. 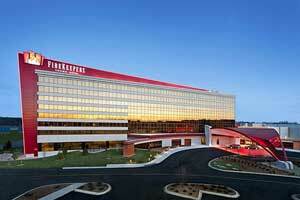 An additional tower for the hotel is being planned at the FireKeepers Casino Hotel in Battle Creek. The need for more hotel rooms is based on the occupancy rate. Over the last few years the hotel has been consistent at just under 100 percent full. The hotel opened in late 2012. It currently offers 243 guest rooms. FireKeepers is owned and operated by the Nottawaseppi Huron Band of the Potawatomi. The tribe decided it was time to add more guest rooms to meet the demand. As of now the limited amount of guest rooms cannot accommodate the requests for groups. An additional hotel tower will allow for the creation of space for events and meetings. This amenity will help attract more guests to the area and boost tourism. When the original hotel tower was opened, adding another tower in the future was already a conversation. However, the official planning did not happen until earlier this year. Many of the official design details and amenities have not been publicly released. The cost of the project has not been announced. Nor has information for how many new jobs will be created. As of now the new hotel tower will consist of 200 guest rooms. Bringing the total amount of rooms on the property to 443. Another dining venue could be added. Also, spaces to accommodate larger meetings and events. The date for the ground breaking has not been released as of yet. Construction contractors and design architects are being chosen for the hotel project.